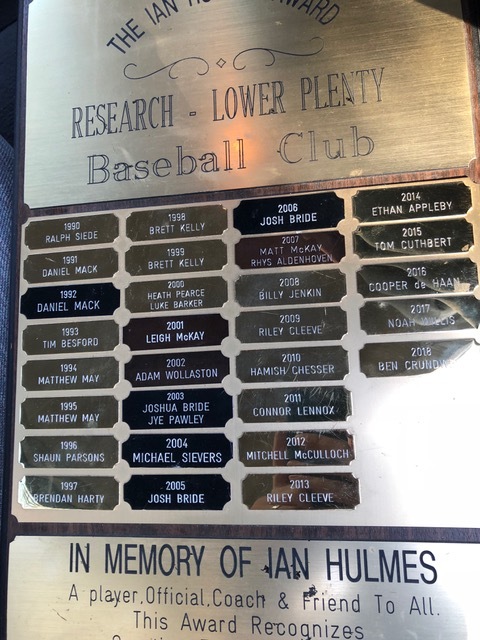 Ian Hulmes was an outstanding player and member of the Research Lower-Plenty Baseball Club for 30 years. Ian won 17 Senior club awards, including 5 best & fairest awards. He represented the Diamond Valley on 6 occasions and was twice selected to the VPBL All-Star team to represent Victoria. As a long serving coach & committee member Ian was recognised with a life membership in 1982. Ian passed away on June 16, 1990 at Glenauburn Park while playing baseball, the game he loved. His legacy continues at the club with his son Steven still playing and his wife Robyn still an active member through her scoring on a Saturday afternoon. The Ian Hulmes award is a perpetual trophy awarded to the junior player that best represents the spirit of how Ian played the game. It is not necessarily awarded to the best junior player, it is recognition of a junior member who has contributed to the club that goes above and beyond just training and playing. The attributes of being a great team mate, is encouraging, is very coachable, a natural leader on the field and assists in other ways when the opportunity presents are some of the criteria for recognition. Below are the previous recipients of the Ian Hulmes award.